So far I have been unable to find any birth records so I don't know who John's parents are. He married Ann Preston. 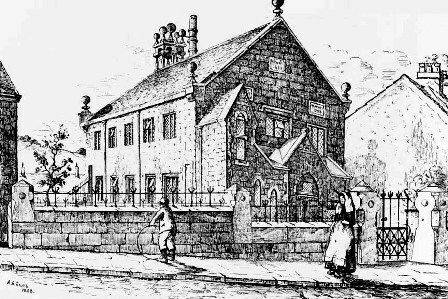 Ann was born in Church Kirk in 1795 to Richard Preston and his wife, Grace. John and Ann were married at St James, Church Kirk, on 17th June 1811. The witnesses were George Heyes and John Holden. 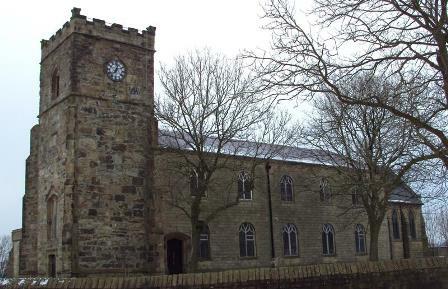 Church Kirk is one mile north, north west, of Accrington, near Oswaldtwistle. St James was a chapel of ease by 1600 but dates back to 642 AD. 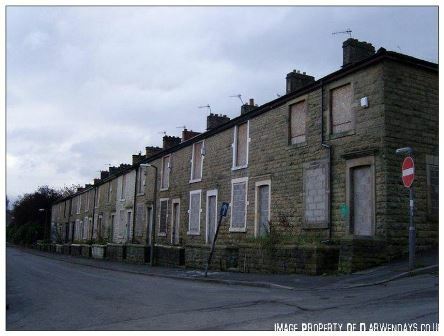 It seems likely that John and Ann lived in Blackburn as it is here that their two (twin?) daughters, Elizabeth and Mary were born. 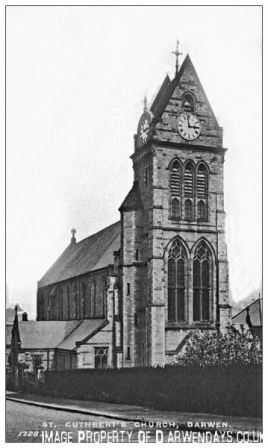 They were both baptised at St Mary the Virgin, Blackburn on 1st August 1813. I don't know when either John or Ann died. The two girls later married two Ward brothers, James and William, also at St Mary the Virgin. In comparison with her sister Elizabeth, Mary had a relatively short and very, very, sad life. She marries William Ward, who is the brother of James (Elizabeth's husband) on 1st January 1832. Joseph Fairbrother is one of the witnesses at both marriages. Of the ten children, four died in infancy: Margaret (1840-1840); Andrew (1842-1842); Preston (1846-1846); and Elizabeth (1847-1848). Ironically, it is because of Preston that I was able to deduce Mary's mother's maiden name was Preston, as the records had more than one Ann marrying John Grimshaw. This important link has opened up my family heritage to the next generation. 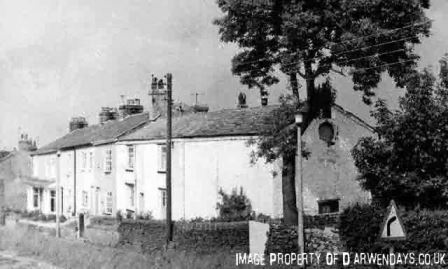 Kitty (1833-c.1836): Kitty was born on 22nd February 1833 and baptised on 27th August 1833 at Lower Chapel, Darwen. Kitty must have died sometime between 1833 and 1837 when births, marriages and deaths had to be registered. She is not in the 1851 census (see below) and neither did she get married. She was probably buried at Lower Chapel but the burial records there are only for 1785-1819. Thomas (1837-1846); we only have records from the Lancashire BDMs, so we would have to acquire birth and death certificates to confirm. Mary, herself, dies in 1849 at the age of 36 years. What a painful life to have had ten children and have lost six of them before she died herself. Sadly, the grief seems to have no end even after Mary dies. 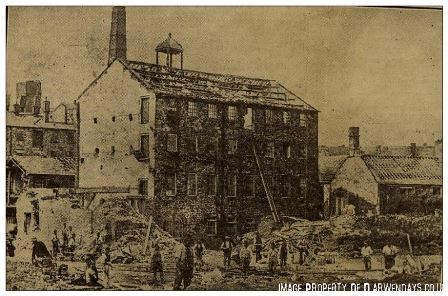 William re-married a Betty Marsden on 1st September 1850; he was a quarryman. His second wife was actually called Betty Shorrock as she had been married before and had lost her husband. She had an illegitimate daughter, Ann Marsden, in 1824 and another daughter, Ellen Shorrock, in 1837. 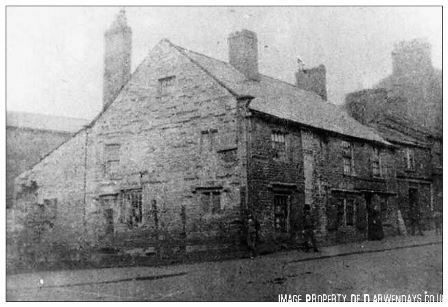 In 1841, Betty and her two children were living in Bottom Street. Jane (1836-1854): Jane was born on 27th February 1836 and baptised on 31st July. 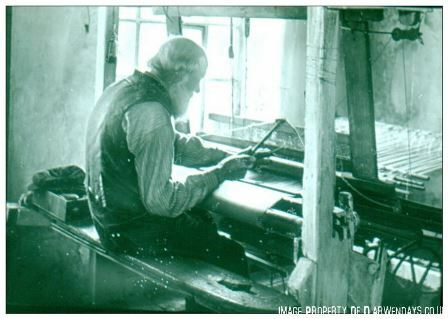 In 1851, like her brother John, she was living with her father and his new wife at 150 Bolton Road, she was a power loom weaver. However, three years later Jane dies at the age of 18 years. I need the death certificate to confirm this. John (1834-1860): John was born on 22nd August 1834 and baptised 9th October 1834. 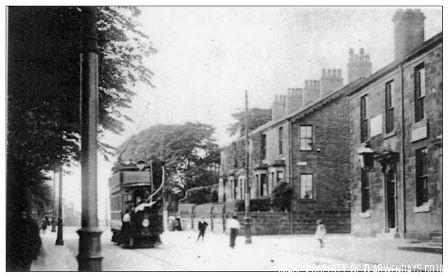 John was living with his father, William and his new wife, Betty, at 150 Bolton Road, Darwen; his occupation is a plate something - I cannot make out what the second word says. It looks like John married Mary Anne Longworth in 1856 and they had two children, Mary Alice (1857-1863) and John William (1859-1860). John dies in 1860. Of course, I need to acquire the relevant certificates to be absolutely sure about this. 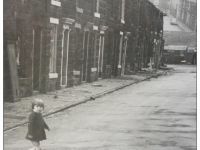 However, in 1861 Mary Anne Ward, who is 24 and a widow, is living, with her daughter, Mary Alice Ward, aged 4, and her mother, Alice Longworth and her children at 7 Hill Houses. Alice is also a widow. It looks like Mary Anne goes on to marry Thomas Fish in 1869, who had also been married before and had three children from his previous marriage. We know this because in the 1871 census there is a Mary Anne Fish living with her husband Thomas Fish and three children; they are living next door to Mary Anne's mother, Alice Longworth and her family at 6 Hill Houses. Ann (1841-? ): In the 1861 census Ann is 20 and is boarding, along with her brother, James who is 17, with the Chadwick family at 4 Ellerslie. Ellerslie is just off Bury Fold. Ann is a cotton worker whilst James is a cotton power loom weaver. I can't even begin to think what Ann and James must have been feeling having lost both parents and all of their siblings. Now I could be barking up the wrong tree here and, like most other things I have said on this page, I would need to get the relevant certificates, but there is an Ann Ward who marries John Holden at Blackburn Registry office (or in attendance) in 1867. In 1871, John Holden, 23, head, cotton weaver; Ann, wife, 30, cotton warper; William 3 and Howard G. 1 are living at 15 Elizabeth Street. This family emigrates to the USA. I have to say, I do hope this is our Ann and that she goes on to have a long and happy life in America. If this is our Ann, they go on to have at least a further four children: J. Sadie; E. Charles; A. Bitha; and Frederick. In 1880 they are living in Deerfield, Warren, Pennsylvania and John is a farmer. James (1844-1878): In 1864, at the age of 20, James marries Susannah Townley from Tockholes. James and Susannah have five children: William, 1865-1870; Mary, 1867-1872; Earnest Jones, 1869-1943; Elizabeth Jane, 1871-1873; Mary Jane, 1873-1937. 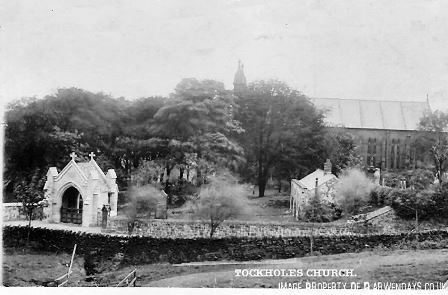 In 1865, Susannah gives birth to William in Tockholes. I am suggesting this because in the Lancashire BDMs it says Witton and Tockholes came under Witton. The remainder of their children were born in Darwen, so the young family must have moved there shortly after the birth of William. Mary follows in 1867, then Earnest Jones in 1869 followed by Elizabeth Jane in 1871, who was born a year after William died at the tender age of five years. The 1871 census has the family living in Darwen: James, 27; Susannah, 32; Mary 3; Earnest Jones, 2; and Elizabeth Jane, one week, living in Hollins Row. At the other end is High Lawn. 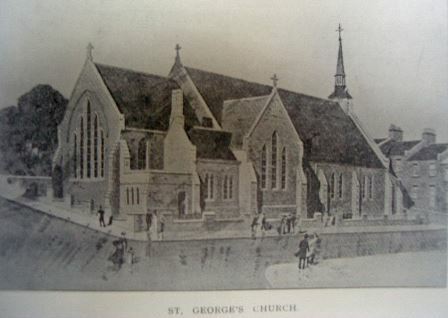 Here is an old photograph of the 'Bottom George'. There are five garden houses then, lower down, were some large detached houses in their own grounds; the third one is High Lawn; it is now an old people's home (opposite Hawkshaw Avenue). At this point in time High Lawn was a private house belonging to Joseph Eccles, cotton manufacturer, and his family. Years later High Lawn provided dinners for wedding parties - I went there several times when I was young to family wedding dinners. Not long after the census was taken, Mary died (1872), also at the tender age of five; then in 1873 Elizabeth Jane died at an even younger age: two years. In 1874 Darwen was hit by epidemics of typhoid and enteric fever - I need to get the death certificates to find out what the children died of. In 1873 their fifth child, Mary Jane was born. Five years later, in 1878, James dies at the age of 34. Susannah dies two years later! Sanitation in the nineteenth century was extremely bad. There was no drainage and no sewerage, and a totally inadequate supply of water, and the surface conditions of the streets, courts and folds were appalling. All this had an adverse effect on the health of the community, and infant mortality was common. Although a Local Board of Health was appointed in 1854, their work was slow and both in 1861 and in 1874 - the year our Sunday School started - epidemics of enteric fever and typhoid swept from one end of the town to the other, taking a heavy toll. One can scarcely visualise this state of affairs when we look at our well paved and well drained streets and consider our abundant water supply. Earnest was adopted by his aunt Letitia, Susannah's older sister. Letitia had married Benjamin Brindle at St Stephens in Tockholes in 1858 and had four children with Benjamin. Benjamin died in 1865 and a year later Letitia marries Thomas Cowell and goes on to have four children with Thomas. In the 1881 census, Ernest is 12 years old and a weaver. He is down on the census as the adopted son of Thomas and Letitia. Thomas is an engineer in a cotton mill. Living with them are Letitia's children from her first marriage, Mary Betsy, 21, Elizabeth Jane 16, both down as step-daughters and both cotton weavers; Joseph, 13; Henrietta, 11; Albert Ed. 5; Alexander Thos. 1; and our Earnest. They are living at 4 Blackburn Road. 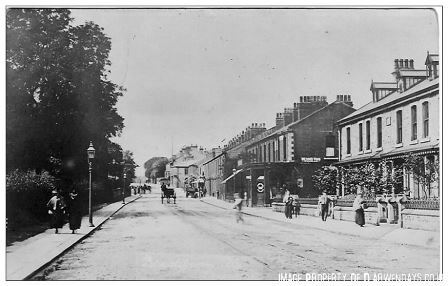 Here is another old photograph, 4 Blackburn Road would have been quite near to here. Ernest and Betsy are living at 46 Argyle Street and Betsy's brother, Albert Edwin Aspin, is also living there. This isn't far from where Ernest was previously living. All three were cotton weavers. By the time of the next census, 1901, Ernest and Betsy had moved to 13 Harwood Street. Ernest is a school cleaner. Betsy died on 7th December 1932, she was living at 18 Vale Street with Ernest. 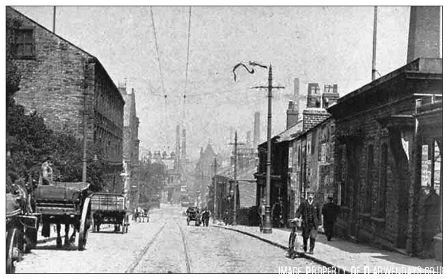 Vale Street is just round the corner from Queen Street. She left £270 to Earnest Jones Ward who was an assistant shopman. Earnest died on 8th August 1943 at the grand age of 74. He was still living at 18 Vale Street when he died. The probate tells us he left £539 12s 1d to Joseph Aspin, general labourer and Entwistle Cockshoot, night watchman. I assume Joseph is Betsy's relative. With Earnest's death, this section of the Ward family comes to an end. I love it when coincidences occur: just a few doors higher up (where the road sign is) my brother, Stephen, built his house! Martha is still working as a domestic whilst Mary Jane is a cotton weaver. 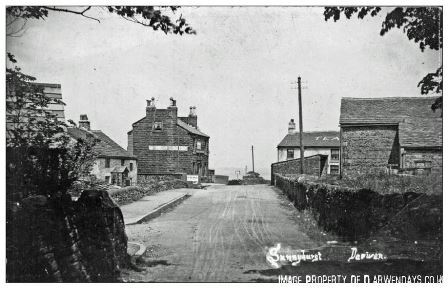 By 1901, they have moved to Sunnyhurst Cottage next to Sunnyhurst Farm. Mary Jane is still a cotton weaver and Martha is living off her own means. Martha dies in 1909 at the age of 77. This means another move for Mary Jane. So by the 1911 census she is living with her brother, Earnest and his wife Betsy, at 5 Queen Street. Mary Jane is still weaving. I think Mary Jane dies in 1937 at the age of 64, but this needs confirming with the certificate.